What did my Cookies for Santa candle smell like? Cookies for Santa was a scent I couldn’t seem to resist. I’m a bakery girl at heart and Village Candles version smelled like a sweet vanilla bakery. Yum!! Create some holiday magic. 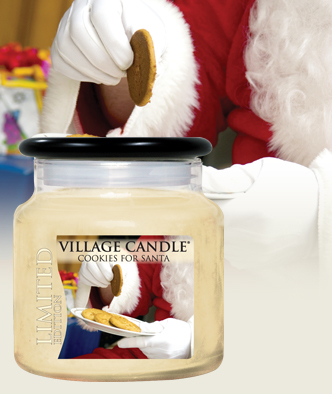 The alluring aroma of fresh baked sugar cookies, rich with butter and vanilla, is a tradition almost as old as St. Nick. There’s no better way to make yours a truly welcoming home for the holidays. First impression… I couldn’t really smell too much on cold sniff but I could detect a subtle warm and sweet vanilla. Nothing fake or synthetic about it. I have a feeling this fragrance will really come to life once the candle is burning. With two wicks, I decided to burn this candle in my master bedroom… a large room that requires a strong candle to fragrance it. Once lit and a good 3 hours later, I ended up moving the candle to a small bathroom. It wasn’t strong enough for a large room and honestly, barely strong enough for a small room as well. The scent… a delicious and sweet vanilla cookie. I loved it. The scent throw however was very subtle. In a small bathroom, the scent was medium to soft. Anything larger than a small room and the aroma would have been lost. Strength breakdown from 1 to 10. In a large room, I would rate this candle a 1. In a medium room, 4 at best. Small room was just right at 7. This candle burned okay but did have a teeny bit of problems. The wicks did struggle at the start with super low flames causing an uneven burn. With a little bit of help, I was able to fix it by removing some wax. From there, it eventually did right itself for a full and even burn. I enjoyed this fragrance but probably wouldn’t purchase it again due to strength. This candle gave a pretty subtle e scent throw. If you don’t mind that and love a warm and sweet vanilla, this scent has your name written all over it. If you however love your candle strong, I would pass on this one.